The New Jersey Treasury Department has written off millions of dollars in debts, including fines, penalties and assessments owed by some of the most recognizable and profitable companies in the world. A six-month I-Team investigation into the state’s debt collection and write-off procedures found firms listed as Verizon, Exxon Mobil, Lloyd’s of London and Burger King have all had debts erased. “It just makes me wonder, why is our government being so lenient?”’ Newark resident Marisol Peters said. New Jersey's Treasury Department has written off tens of millions of dollars in debts from companies and individuals that owe the state money, and is refusing to provide records of the disappearing debts to the public. Chris Glorioso reports. The Colonnade’s erased debt is just a tiny fraction of the $83 million in debts wiped off state books since 2010. In October 2012, the I-Team filed a request under the New Jersey Open Public Records Act for copies of all non-tax debt erased from Treasury accounts. State Treasurer Andrew Sidamon-Eristoff initially provided only heavily redacted records and declined to answer questions about the debt write-offs. After the I-Team filed a lawsuit, the state relented, providing unredacted records. In total, individuals and companies owe New Jersey more than $524 million in outstanding debt dating back decades. A majority of that sum would be impossible to collect because the individuals who accrued the debts have died, been incarcerated or gone bankrupt. In the case of corporate debtors, many have gone out of business. But an I-Team analysis also found tens of millions of dollars in outstanding debt that remain questionable. State records often list these as “Doubtful Accounts,” with no further explanation. Former Democratic State Sen. Gordon MacInnes, who now heads the non-partisan think tank New Jersey Policy Perspective, said writing off debts without clearly documented explanations could give the appearance the state is more lenient with businesses than with individual citizens. “Even when you have fairly modest fines to profitable corporations being written off, it’s unfair if the individual citizen is being pursued for fines that are even smaller than that,” MacInnes said. Treasury spokesman Bill Quinn said in a a statement that debt write-offs do not represent capitulation. “Simply because a debt has been written off does not mean that we cease our efforts to collect on it. And we often do collect on debts, even when they have been inactive for many years, through offsets to the state benefits or payments that are due to the debtor,” Quinn said. Last year the state paid collection agency Penn Federal almost $900,000 for its efforts in collecting $6.4 million in non-tax debt. New Jersey recently inked a contract with a different debt collection agency for fiscal year 2013. Deciphering why a debt has been erased can be difficult, partly due to the Treasury Department’s failure to follow its own rules. In order to explain some of the forgiven debts the I-Team asked about, Treasury personnel spent weeks inquiring with other state agencies like the Department of Environmental Protection and the Department of Banking and Insurance. According to Quinn, more than $16,000 in erased fines attributed to Exxon and Verizon were actually assessed against franchise owners – not the parent companies. 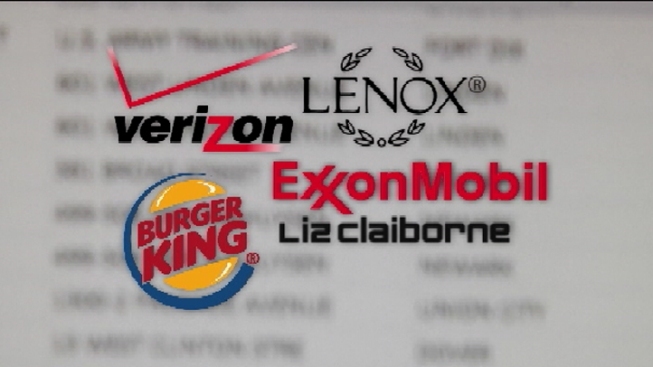 The records obtained by the I-Team say the fines were incurred by entities using the names Verizon Communications Inc., Exxon Mobil Corp., Exxon Company USA, and ExxonMobil Oil Corp.
An Exxon Mobil spokeswoman said she was investigating the fines. Verizon did not respond to the I-Team’s phone message. The Treasury Department was unable to locate records underlying more than $7,000 in fines erased for Burger King, Liz Claiborne, and Lenox China. A spokeswoman for Fifth and Pacific, the company that owns the Liz Claiborne brand, said a $1,000 environmental fine was probably accrued by a licensee, not the parent company. Burger King also said a $4,200 environmental fine attributed to the fast food chain must have been intended for a franchisee that went out of business. A representative for Lenox China said records of an erased $1,750 environmental fine could not be located. Write-offs of financial assessments and fines were often the largest deleted debts. Global insurance firm Lloyd’s of London had more than $400,000 in regulatory assessments erased after the state lost documents supporting the charges. Back at the Colonnade, Peters remains befuddled as to why her landlord was never forced to pay that $26,000 for the bad boilers. A Colonnade representative said the building recently installed a new energy-efficient boiler system. Peters believes the fine should still stand.